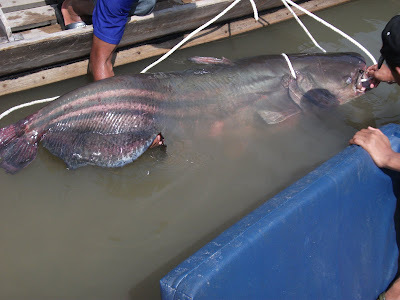 The Tapah as it is known in its native land is a large catfish. Once reaching over 6 feet, this catfish is now found in much smaller sizes. The natives fear it because of its known habit of eating small ducks, dogs, and small children. It is thought the Tapah became this agressive due to natives laying to rest their dead in the water. The catfish would then see this as a ready supply of food. Conditioned feeding of human corpses over the centuries created a fish that has a taste for humans! The locals says that these fish sometime feed on monkeys as the reach down for a drink of the river. These fish when caught will try to bite - gloves and long nose pliers must be used to remove hooks. Fishing these fish requires lines between 25 to 35 lb breaking strain. Hooks require wire trace to prevent their sharp serrated teeth from cutting your line. Method of fishing is the same as for the Toman. Distribution : Asia: Pakistan, India, Sri Lanka, Nepal, Bangladesh, Myanmar, Thailand, Vietnam, Cambodia, the Malay Peninsula and Indonesia. Reported from Laos (Ref. 9497). Biology : Found in large rivers, lakes and tanks. 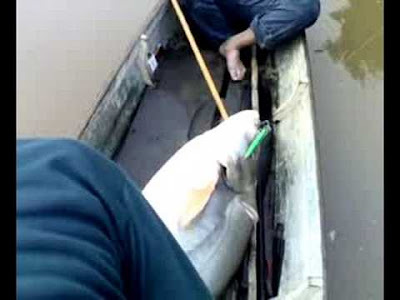 A large, voracious and predatory catfish which thrives in heels with grassy margin. Associated with deep, still or slow-flowing water with a mud or silt substrate (Ref. 6028). Sluggish and stays on muddy or silty bottom in search of food. Juveniles feed mainly on insects; adults on smaller fish, crustaceans, and molluscs. Abundant during the warm season; a premonsoon summer breeder. Destructive to other more valuable food-fishes. Bites strongly if handled, with its huge mouth, formidable jaws, and band of conical teeth. The upper teeth and lower measure 4 mm in length. As seen on these images, the teeth point toward's the back of the throat. Inside, on either side of tongue are additional teeth which point forward.